I initially got the idea for a juice cleanse from my co-worker, Maria. See, we have a weekly/monthly work-out competition at our office. Whoever works out the most for the week gets to pick where we eat for lunch on Friday. Whoever works out the most for the month gets to pick the company bonding event for the following month. Maria read an article in The New York Times and threatened that if we didn’t work out enough that month, she said she’d make all of us do a juice cleanse as our bonding event / punishment. Little did she know that I was thoroughly intrigued—partly because the article talked about finance people in major cities as Dallas, Houston, and Chicago (cities that are dear to my heart)—and started bookmarking recipes. Even though I really wanted to try it out, I made up a bunch of excuses why I wouldn’t start the juice cleanse such as “oh, I’m going to NY this weekend,” “I need energy to get through my swimming boot camp,” “I need to finish the upcoming mud run,” to things as silly as “I’m eating with so-and-so this day.” I finally sucked it up and picked 3 consecutive days to do the cleanse. And managed to sucker two people (Ben and my other co-worker, James) to do it with me. So…how exactly does the cleanse work and what is it supposed to do? The easiest way to explain it is that your stomach spends the majority of its energy digesting and breaking down all the solid food (including all the junk and processed food) that you stick in your body. The cleanse gives your stomach rest from processing solids and it can use that extra energy to break down and process all the toxins it usually doesn’t have a chance to do. Surprisingly, from a physical standpoint, I wasn’t that hungry. I’m definitely was more mentally hungry than anything else. I seriously couldn’t stop thinking about carbs – pho, ramen, spaghetti, beef stroganoff (I don’t even know the last time I even ate this? ), and fried rice. How does the juice taste? Really good! The apples in both the green (veggie) and red (beet) juices make both of them much more bearable and very delicious! 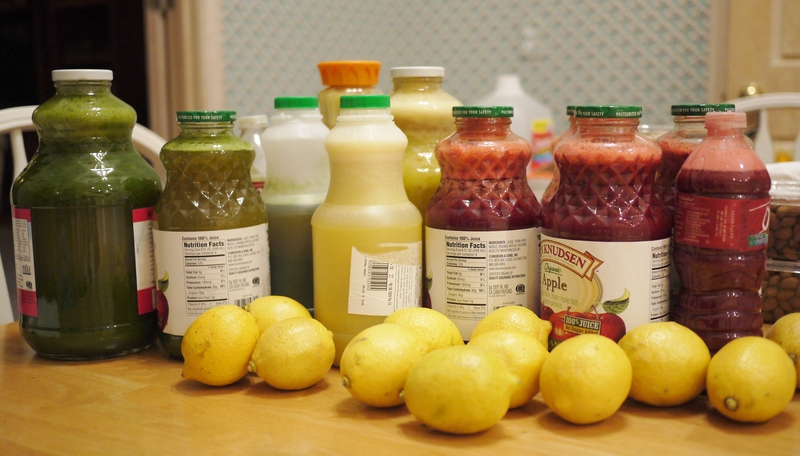 For the cleanse, you are supposed to drink six 16-ounce bottles (equivalent of an Ozarka water bottle) of juice. There are 5 different juices, one juice gets repeated (can be any one except the cashew milk). Instead of shelling out $150 each for 3 days of juices, I found DIY recipes online that modeled the commercial juice plans. I ended up spending a total of $125 for the three of us on ingredients. 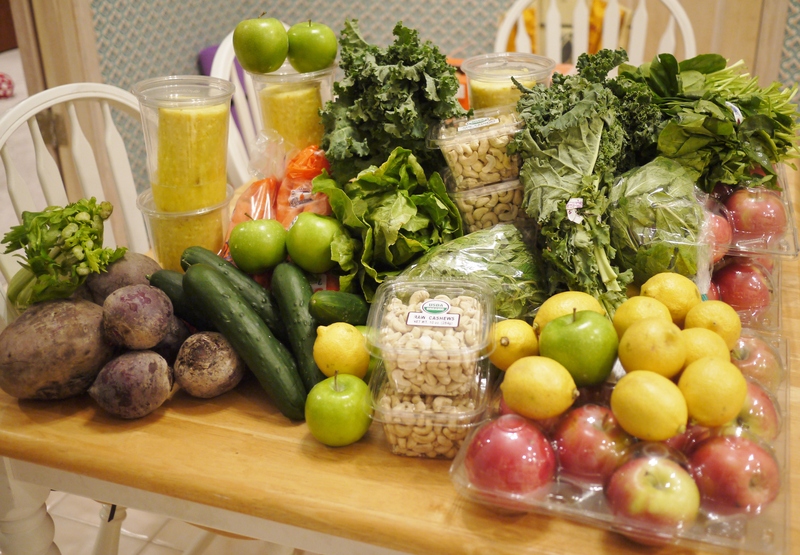 Tip: Get as much produce as you can at the Asian grocery store! Now, I didn’t really figure out my portions correctly and ended up with ingredients for only 5 juices per person per day. Oops. Here are the recipes as well as the order you are supposed to drink them in. As always, I combined a bunch of recipes together and made my own variation of them. Really, only the first three juices require a juicer. Even then, it took 3 hours to wash, cut, and juice 27 bottles worth of juices. So exhausting. After the cashews are soaked, put all the ingredients in a blender and blend for 1 minute (or until there are no more chunks of cashew). The drink will be a milky white color. On the first day, I put too many cashews (or not enough water) and it had the consistency of a smoothie. YUMMM! When using the right proportion of ingredients, the consistency is more like milk, still yummy. This drink was so easy to make and so good; I’m definitely going to be making it more. And try it out with raw almonds too! Ben said that he felt light-headed and weak throughout the cleanse. James said that he felt fine and thought the cleanse worked for him. It also has helped him cut back (portion control) now that he’s eating again. Would you do the cleanse again?